Have you started enjoying the chilling sensation in the air? Winter is just around the corner. Winter gets decked up with a variety of sumptuous food items and some of the best looking clothes of all-time. Also, winter is the season while we need some precaution to get ourselves from getting cold-caught. 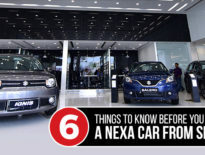 Here the best Nexa showroom in Ranchi puts some cool advice on board on keeping some essentials inside your car while driving. Winter is the season when cars start doing hanky-panky at large. It can get stuck in the middle of the road for several hours. While buying Nexa cars from any authorized Nexa Showroom, the salespeople will always give you a proper guideline about the essentials which you must carry in the winters while driving your favourite Maruti Suzuki Nexa car. Jumper cables: You can’t move an inch if your battery doesn’t respond. Keep jumper cables there inside your car to avoid this unmoving hazard (all the time). These will immediately add life to your battery. Battery blanket: A battery blanket is the most neglected essential by the Nexa car users. Though if you ask any expert at our Nexa Showroom in Ranchi they will forever ask you to take it along on your drive especially for the winters. Be it a Nexa car from Maruti Suzuki brand or any other luxury car, batteries take a longer time to get heated in winters. Here you need a battery blanket for serving warmth to the battery. Extra vehicle fluid: Window glasses, wipers, and even car locks lose the moisture level in winter. Which reflects in their ability to perform. There are multiple companies in the market which sell vehicle fluid. Besides, you can also make it your own by 50:50 mix of fluid and water. You never know when need it. It’s better if you make stock in your garage before things get cold. Flashlight: The northern part in India has been in the headlines for ‘smog’ before and during the winters. Basically, winter is the season when we rejoice in fog and mist. A flashlight, therefore, is a must-keep essential for all the car users. In less daylight, you can easily find and fix issues with the help of this flashlight. Snow salt: While driving on the Indian roads in the winter, some of the major mishaps cause due to the slippery surface of the roads. Here comes the utility of snow salt. A pinch of snow salt on the tyres makes them dehydrated. It also protects those from getting perilous. AAA approved emergency escape tool: In case of any mishap, it’s better to become a little preventive with a cheap tool-kit in the glove box. A car hammer and seatbelt cutter are easy on the pocket. These little things can turn out to be the biggest life-savers. A first-aid kit: You never know when you need it or maybe anyone needs it on road. For major/minor injuries a first-aid kit is the best thing to have at reach. A versatile shovel: Definitely, you won’t want to travel along with a giant size shovel inside the car. But, certainly, you need a compact yet versatile shovel to get rid of unfortunate road hazards. Gloves: Being a top-class Nexa showroom in Ranchi, we would always suggest you carry a pair of good quality winter gloves. In case your car breaks down, you can do things like tyre removal, small part fix, towing faster on your own. Ice scraper: Winter is the ideal time to visit hill stations. Don’t just go to the hill stations. Instead, drive to the hill stations. Take the excitement to a different level. Drive all the way in your own Maruti Suzuki Nexa car. While driving to the exotic icy locations you need to be a little prepared for the trip as well. Store ice-scraper in your the dicky so that you can make your way smoother. So, the ice-scraper is always a good investment. Whistle: A whistle is not something really heavy to carry. When in danger, a whistle performs better than throwing your hands and legs in the air. It can do a smart job to get all the rescuers to reach on the spot. A two rope: By any chance, if your car gets stuck in the hurdles a rope can pull your car out. It can also be useful for any other car that needs help. You see a little sharing is always cool. See Also How Social Media Marketing Can Benefit the Automobile Dealership Business? Do you have something else in your mind that we are skipping? Write down in the comment section. Call us to know the best offers for your favourite cars. This article is powered by M&M Web Solutions.